Third baseman Morgan Ensberg played eight seasons in the major leagues for the Astros, Padres and Yankees, hitting 110 home runs. 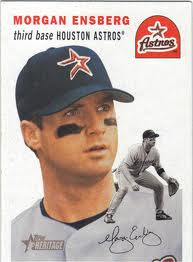 His best season was 2005, when he hit .283 with 36 HR and 101 RBI for the NL Champion Astros. Now the host of Sirius XM MLB Roundtrip and author of the blog Morgan Ensberg's Baseball IQ, he kindly answered my questions about baseball cards. My favorite card has Adam Everett's face on the front and my information on the back. I put that card in a display that I gave him at his retirement party. My favorite cards are the Topps throwbacks. They look like the cards from the 50's and 60's. I don't collect baseball cards. Mark Grant pitched eight seasons in the major leagues. His best year was 1989, when he went 8-2 with 2 saves and a 3.33 ERA for San Diego. 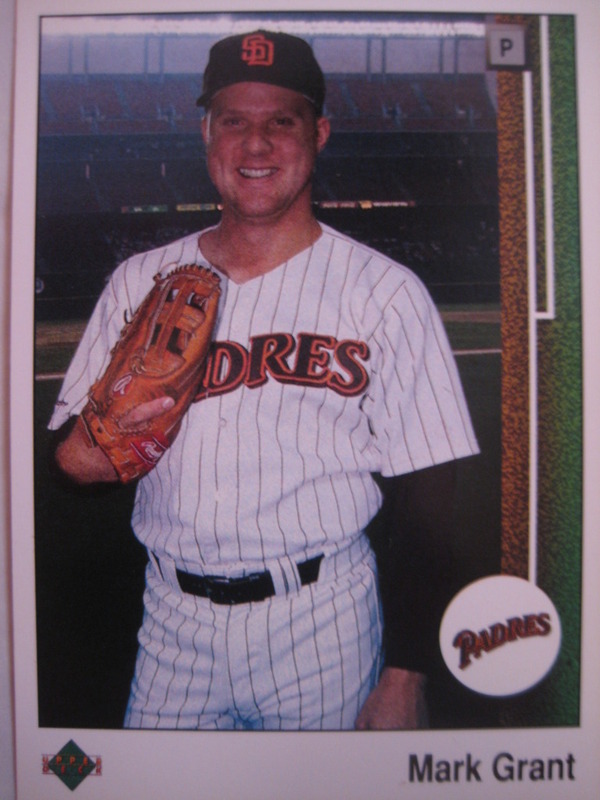 Now a Padres broadcaster, he kindly shared with me this baseball card story. "On one of my cards, I'm using Tony Gwynn's glove. It's a 1989 Upper Deck card. #622. I was a starter and wasn't pitching that night. The photographer needed a picture of me right before the game. I didn't have a glove with me. Tony was ready to take the field, and I said to him, "Hey T...I need a glove for the picture!" So he tossed it to me. If you look closely, you can see a "19" under the red circle "R". 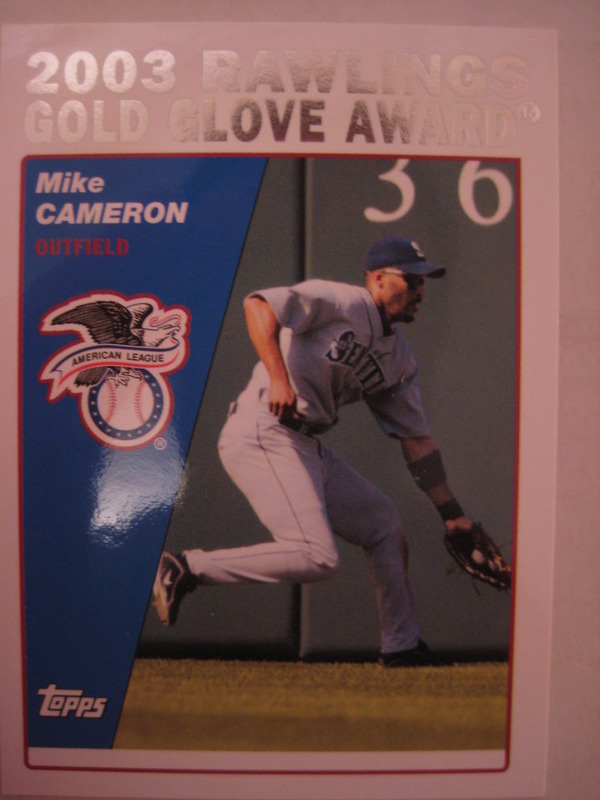 It's the only time I was a 'Gold Glover'!" 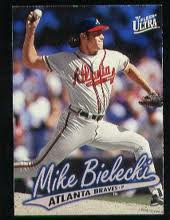 Mike Bielecki pitched 14 seasons in the major leagues, winning 70 games. His best season was 1989, when he went 18-7 with a 3.14 ERA for the Cubs. He kindly answered my questions about baseball cards. "I don't collect. But I have plenty of myself. My favorite card is from 1997 Fleer." Thanks! I don't have his 1997 Fleer card, but here is one I do have, from 1987 Fleer. Wayne Gomes pitched six seasons in the major leagues, mostly with the Phillies, winning 30 games and saving 29. Now the owner of the Virginia Baseball Academy, he kindly answered my questions about baseball cards. I have one card that says i have a 90 mph curveball. My rookie card in my college uniform. Thanks! Anyone know which card has him throwing left-handed? Mike Buddie pitched five years in the major leagues for the Yankees and Brewers. He went 4-1 for the world champion 1998 Yankees. Now the Associate Athletic Director for Administration & Development at Wake Forest University, he kindly answered my questions about baseball cards. 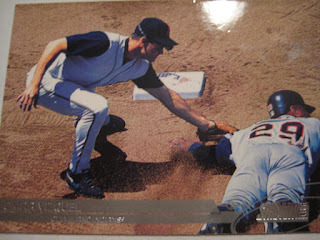 "My favorite card is my 2002 Topps Total card from my days in Milwaukee- its an action pic from my best year. I collected as a kid, but don't anymore. I honestly don't pay close attention to MLB these days. " Thanks! I don't have his Topps Total card, so here is one from my collection, from 1993 Classic. Mark Sievert pitched seven years in the Blue Jays and Rangers organizations, going 44-26 with a 3.74 ERA. Now a fifth grade teacher at Lake Denoon Middle School in Muskego, WI, he kindly answered my questions about baseball cards. There is a baseball card out there of myself that has me wearing a right handed glove as I was playing pepper with a teammates glove at the time. The back of the card said I threw left handed which was not true of course. My favorite cards are of my teammates as I recall the great memories of the game. - Do you collect baseball cards? I do not collect baseball cards myself, but my in-laws are avid collectors having many rare and impressive cards (e.g. a Jackie Robinson original). Thanks! 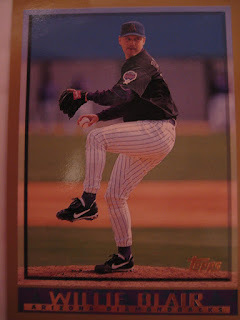 I couldn't find a picture of the card where he throws left-handed, so here is one where he is throwing right-handed, from 1996 Bowman's Best. Jim Edmonds played seventeen years in the major leagues, mostly for the Angels and Cardinals, hitting 393 home runs and winning eight gold gloves, making him one of the best outfielders of his era. Now the owner of the Jim Edmonds 15 Steakhouse in St. Louis, he kindly answered my questions about baseball cards. "I collected baseball cards as a kid. But not many. I didn't have a lot of money growing up. So baseball cards weren't a priority. Don't know where any of them would be today. Having a card of yourself was one of the coolest things when you're a young player. Nowadays, I save them for my kids. My favorite card is one with Darryl Kile and myself on the same one." 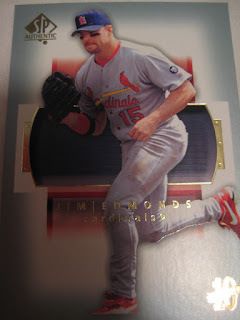 Here is a card of Edmonds from my collection, from 2003 SP Authentic. 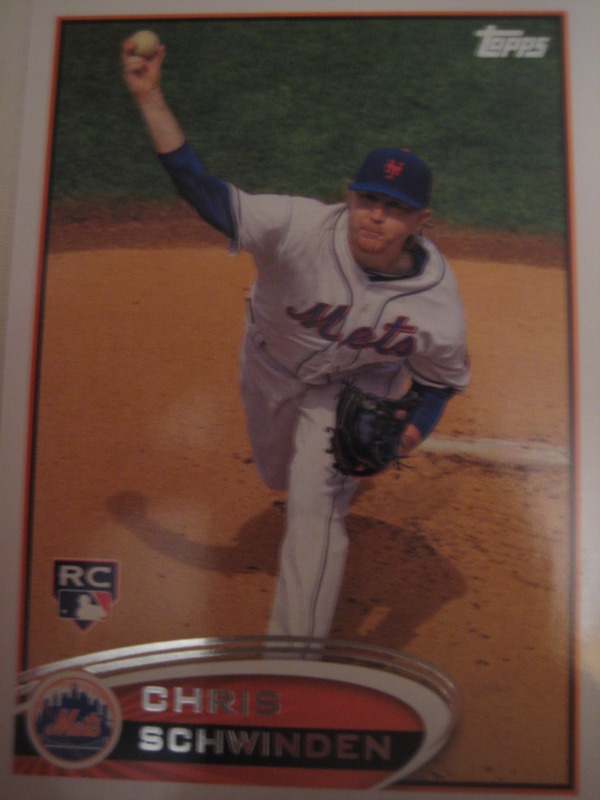 Chris Schwinden was drafted by the Mets in 2008, and made his major league debut in 2011. He is expected to compete for a starting rotation spot this year. He kindly answered my questions about baseball cards. "I collected a lot when I was little but not too much anymore. Just some of the guys." Infielder Matt Kata has spent parts of five seasons in the major leagues. Last year, at the Rangers AAA affiliate in Round Rock, he hit .293 with 13 HR and 71 RBI. He was re-signed by the Rangers in December. He kindly answered my questions about baseball cards. 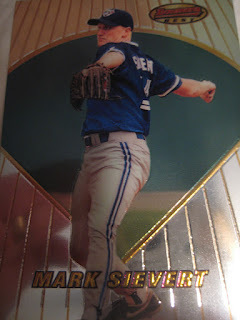 "My first professional card with the South Bend Silver Hawks was pretty tight! I was at short and taking a throw from the catcher on a steal and blowing a bubble at the same time. Pretty cool shot for your first card. 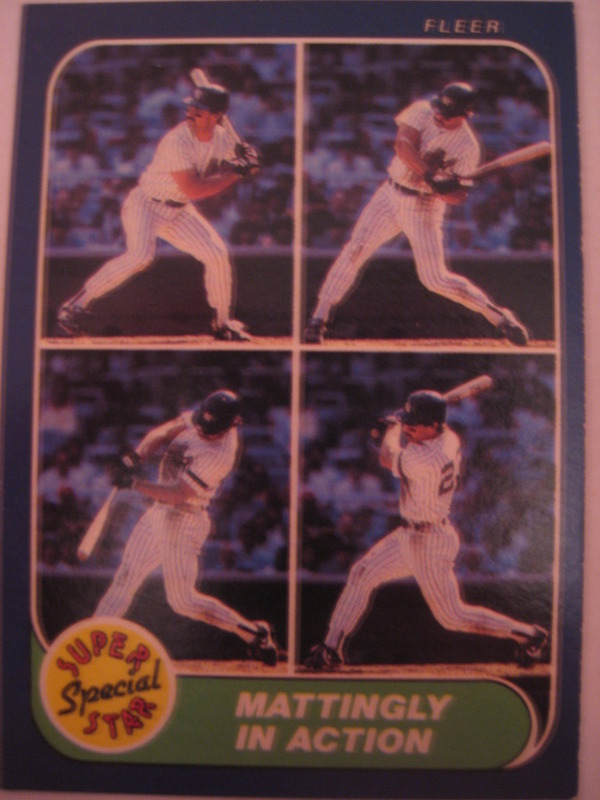 I always carried an old Chico Lind card with me of him making a jump throw with his legs spread in the air and also a Don Mattingly card where they sectioned his swing into 4 parts. Sweet swing. I was a big collector growing up. My dad shared an office with another doctor who had his own card shop and I got to see some pretty awesome cards; Mantle rookies etc. 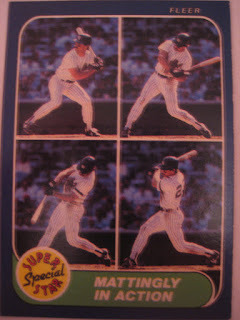 He gave me all the 1984 sets in a box and I remember thinking I had a gold mine; Clemens, Gooden, Mattingly, Strawberry. Donruss, Fleer, and Topps. Still have them. I bet I "flipped" away some good money on the playground though. And I love hearing the stories from all of my uncles about how my grandma burned Mantle rookie cards and a bunch of other expensive cards that were in the attic. Should have sold my mint McGwire USA card way back..."
Thanks! I couldn't find a picture of the South Bend card, but here is one from Upper Deck. Larry Broadway played eight seasons in the Montreal, Washington and Pittsburgh organizations, hitting 104 minor league home runs. Now Director of Minor League Operations for the Pittsburgh Pirates, he kindly answered my questions about baseball cards. Thanks! Unfortunately I couldn't find a picture of the Sand Gnats card. Any of you readers have it? Pat Clougherty was a member of the Team USA baseball team, the all-time home run leader at North Carolina State, and a Padres draft pick. Now an Area Sales Manager at Sandoz, he kindly answered my questions about baseball cards. "I love baseball card collecting. Have a great collection, but have been out of it for the last 10 yrs or so." Marty Cordova, the 1995 American League Rookie of the Year, hit 122 HR in nine major league seasons. Now the owner of Skeletal Metal, a company which produces UFC-related jewelry, he kindly answered my questions about baseball cards. "I had a card that on the front I was swinging a bat that was broke. Almost the whole barrel long ways. It looked like I was swinging a sword. 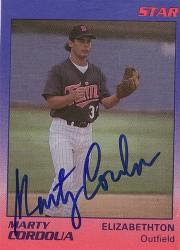 The first card I ever had, Elizabethton Twins, they misspelled my name Marty Cordoua. That sucked. I have a ton of my own cards. If there was a rare one or the action figure I had, Starting Lineup. That's all I would want :) "
Drafted by the Blue Jays in 2006, Graham Godfrey made his major league debut in 2011 with Oakland, going 1-2 with a 3.96 ERA in five games. He kindly answered my questions about baseball cards. "I grew up collecting cards, comics and action figures. I went to trade shows all the time with my dad. I still have a good collection of cards and i kept all my action figures that are in their original package. I collected mostly baseball and basketball cards. The action figures I still have range from Starting Lineups to Marvel X-Men action figures. 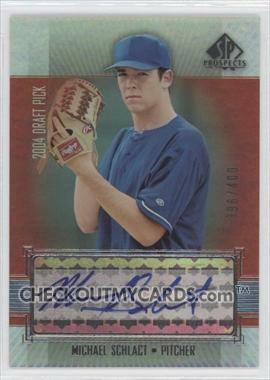 My favorite card of myself is from the 2009 season when I was with the Midland Rockhounds. 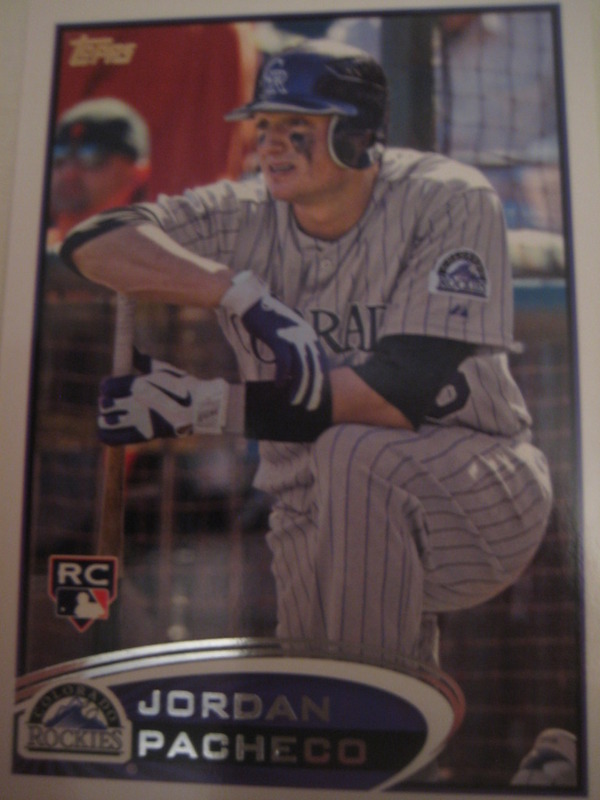 However my rookie card from this past season is really special to me. 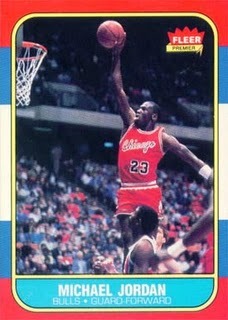 Some of my favorite cards are the 1989 Bill Ripken Fleer and the 1986 Michael Jordan Fleer rookie card. My favorite card set I own is the 1990 Leaf baseball set." Thanks! I couldn't find a picture of his Midland card - any of you readers have one? 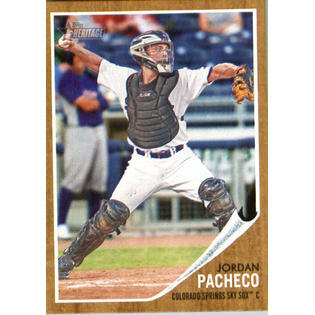 Catcher Jordan Pacheco, Colorado's ninth round draft choice in 2007, made his major league debut in 2011, hitting .286 with 2 HR and 14 RBI. He kindly answered my questions about baseball cards. "Actually my grandpa was a big collector of cards and so was my dad, so now actually we have a bunch of baseball cards. We have a a couple of important rookie cards that I think some people would want to have. However as for myself I don't really collect them. I am more of a bat and ball collector guy. 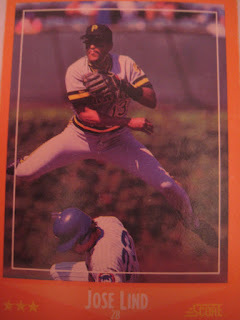 My favorite baseball card is any card that Bruce Billings is in...that guy is a character..." Thanks! Here is a card of Pacheco from 2012 Topps. 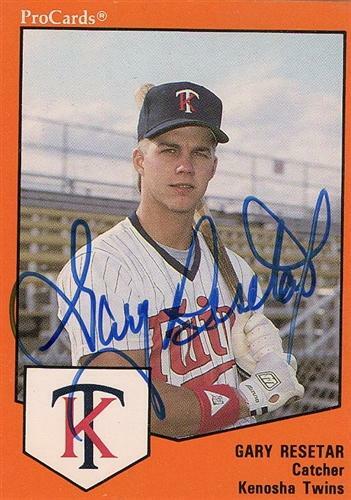 Gary Resetar played in the Twins, Indians and Rockies organizations from 1988 to 1995. His best season was 1990, when he hit .278 with 4 HR and 44 RBI for the Orlando Sun Rays. Now a Project Manager for the construction company Flintco, where his projects have included the construction of the new Oklahoma Federal Building, he kindly answered my questions about baseball cards. 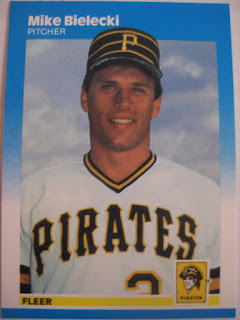 "I used to get a kick out of pitchers that wanted to take their photo with a bat or guys that would borrow a lefty (or righty) glove to mess with someone who checked the back of their card to see which hand they threw with…. Not exactly hilarious or anything, but it was amusing. I don’t collect baseball cards myself. But I have tried to keep copies of my own cards, and I do have whole sets of most of the teams I played for. I just keep them for my own memories. 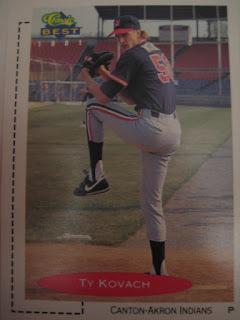 My favorite card of me would probably be my first baseball card from 1989 when I was with the Kenosha Twins. Just because it was my first. As far as any other cards that are a favorite…. I have one and only one that is a cherished item. I grew up in New Jersey and was a Yankee fan. I have a Thurman Munson baseball card that has been a bookmark for every book I have read since college. It is well worn now, and one of my kids got hold of it when he was a toddler. He did a number on it, but I was able to tape it up and salvage it. I have never been worried about it as a collector’s item. It has been something valuable to me as Munson was one of only 2 players I can say I idolized as a kid and baseball player growing up. So I make sure to keep it safe." Thanks! 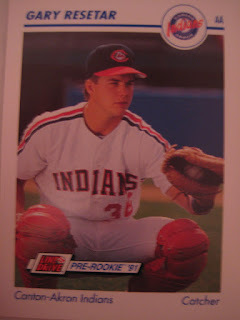 I have one card of him in my collection, from 1991 Line Drive. 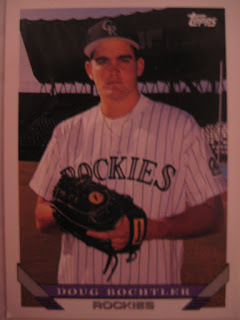 Colin Young pitched in the Rockies and Red Sox organizations from 1999 to 2004. 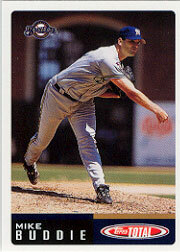 His best season was 2001, when he went 4-3 with 21 saves and a 1.42 ERA for the Salem Avalanche. Now a private baseball coach in Texas who has his own blog, Baseball Perspective, he kindly answered my questions about baseball cards. I collected cards when I was young and can remember getting my first complete set (Topps '86) and how excited I was. I had about 10 large binders full of cards that I think (and hope) are still at my parents' house. Don't worry though, my mom knows enough not to toss them....haha. I remember being offered my first Topps contract and how thrilling it was. It felt like it legitimized my baseball career. When someone asks you if you played ball and you can direct them to your baseball card, it is a gratifying feeling. I was a big Don Mattingly, Ken Griffey Jr., and Jack Clark fan. It's funny, Jack Clark ended up being my father-in-law so now I have so many of his cards I don't know what to do with them. I always wanted to get their cards. The first edition of Upper Deck with the Griffey rookie card was probably my favorite. The cards I like of myself are the action photo ones. For some reason the still pose ones seem kind of cheesy to me. I don't collect anymore but I have started my sons on collecting. I really believe it was my love of baseball and the connection that the cards had to the players that increased my love for it. Every trip to the store I try and get them a new pack. Frank Catalanotto played fourteen seasons in the major leagues, hitting .291 in over 4000 at-bats. Now the owner of vitamin supplement company Proven 4 and the Frank Catalanotto Foundation, which raises money and awareness for the Vascular Birthmark Foundation. He kindly answered my questions about baseball cards. "I was a big baseball card collector when I was growing up. Some of my favorites were my Don Mattingly and Dave Winfield rookie cards. I was a huge Yankee fan. When I got to the major leagues I always made sure I got a bunch of my cards from that particular year. My favorite card of myself is a 2002 Donruss Elite which has my career best .330 BA on the front of the card. The only story I have about cards of myself and others is in the spring of 2008 a bunch of us on the Texas Rangers decided to grow mustaches so we would have baseball cards with mustaches on them. I grew a fu manchu and have a card of myself that looks pretty funny. Out of the 8 or 9 guys that said they were going to do it, there wound up being only 3 or 4 that actually went through with it. " Thanks! I looked at all the Rangers in 2008 Topps Heritage online and the others with mustaches are Ramon Vazquez and Milton Bradley. 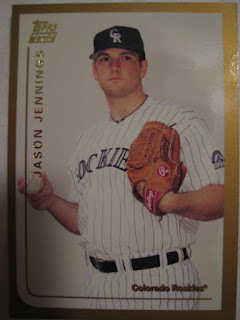 Jason Jennings, the 2002 National League Rookie of the Year, pitched nine seasons in the major leagues, winning 62 games. Now the owner of the Pastime Training Center in Frisco, TX, he kindly answered my questions about baseball cards. "I collected cards when I was younger. My dad would always stop by the gas station on the way to practice and get me a pack of cards and I would chew the nasty stick of gum while at practice. 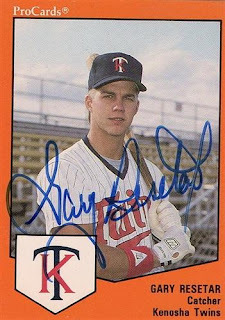 My best memory as a pro was when I first signed I was in Low-A Asheville and Topps wanted me to sign 1,000 cards in one day. They said if I did they'd have a Nolan Ryan poster waiting for me. It took till the 7th inning of the game that night (obviously it wasn't my night to pitch) to get it done, but I wanted that poster." Thanks! I don't have the autographed version of that card, but do have the regular version. Outfielder Mike Cameron has spent seventeen years in the major leagues, hitting 278 home runs and stealing 297 bases. He is a three-time Gold Glove winner who has hit over 20 home runs in a season eight times. He is signed with Washington for the 2012 season. He kindly answered my questions about baseball cards. "Only one story - people keep sending me a card with my name on it and Randy Winn's pic so I don't sign em." Ty Kovach pitched five seasons in the Indians and Mariners organizations. His best season was 1990, when he went 12-3 with a 2.56 ERA for the Kinston Indians. Now a Mortgage Loan Originator at Fifth Third Mortgage in Medina, OH, he kindly answered my baseball card questions. "The very first card of me in Watertown NY was probably the favorite for me. I was pitching that day and missed the "typical" head shot for the card and they took a picture of me pitching which was pretty cool and was my favorite card. The way the shadow was over the plate and myself in the sunlight was pretty cool looking. I do not collect baseball cards, but I am still humble when I receive about 3-4 times a month people sending me cards to sign. I do believe I get cards still to sign due to the fact that I played with Charles Nagy, Jim Thome, Manny Ramirez just to name a few and they are looking for a full set of their minor league team set. Now I am a mortgage loan originator here in Medina Ohio where I live with my wife in a house we built 8 years ago. I have 4 wonderful step-children and 3 grandchildren and love them all as if they were my own." Thanks! I don't have that card, but do have this one from 1991 Classic Best. 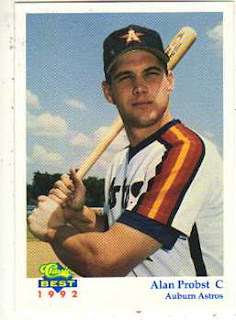 Catcher Alan Probst played ten seasons in the Astros, Blue Jays and Mets organizations. He is now a successful producer of outdoors television shows - his programs All Outdoors with Alan Probst and North American Trapper air on various channels around the country. He kindly answered my questions about baseball cards. 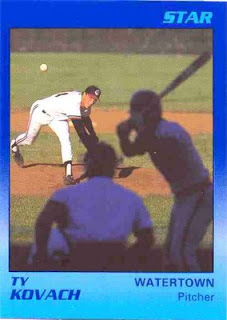 Don't have any stories about any cards but do remember the f**k face Billy Ripken error card back in the day. Lol. My first card from 1992 Auburn Astros. Used to collect cards but sold most for beer and food money in college. Had Mantle rookie plus many other prizes but basically gave them away for spirits. Live and learn. Jesus Guzman originally came up with the Giants in 2009, but had a breakout season last year with San Diego, hitting .312 with 5 HR and 44 RBI after a mid-season call-up. He kindly answered my questions about baseball cards. "My favorite player is Omar Vizquel! I like to learn from players who have more experience in baseball! Playing for the same cause, to further develop your experience in baseball is a good thing." Thanks! I assume that means he likes to collect Omar Vizquel cards. Here is a card of Guzman, from 2009 Topps Update. Michael Schlact pitched in the Rangers organization from 2004 to 2010, winning 34 games. Last year he went 6-4 for the independent Southern Maryland Blue Crabs. An active blogger and tweeter, he kindly answered my questions about baseball cards. I remember the 1st time I was approached by a baseball card company. Upper Deck asked me to do a signature series for them and I was blown away. I used to collect cards as a kid, and to have my own was such an honor! It took FOREVER to sign all the individual stickers that were to be placed on each card, but it was totally worth it when I finished. 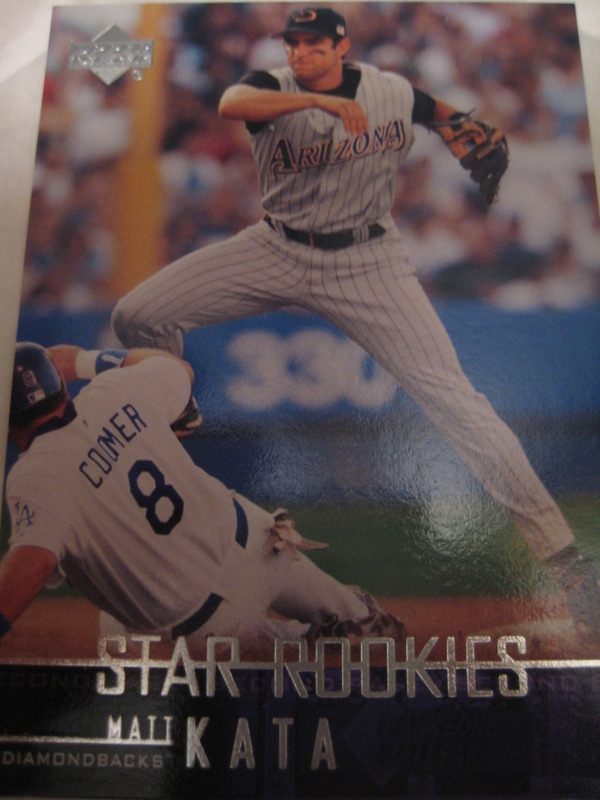 My favorite card is the Upper Deck rookie card that I had done when I was drafted. I think your first card is the most sentimental. I used to collect cards. I have gotten away from it since I became a pro player, but it still interests me to see how much money old cards can go for! Catcher Brandon Smith played in the A's and Mets organizations from 1991 to 1995. Now the owner of BaseballSmith baseball instruction in Marietta, GA, he kindly answered my questions about baseball cards. "I signed out of high school with the A's in 1991...Played 2 and 1/2 seasons with the AZ Rookie team which won two championships. I had a shoulder and a knee surgery in my first 2 seasons. So when they released me I was ready to "hang 'em up". Until I realized I did not have a baseball card. Even though I had 2 championship rings I still wanted a card. I went on to sign a minor league contract with the Mets the next season. I was assigned to the Pittsfield Mets. This was a short season A club. Early in the season I was sent to AAA for 2 weeks while Brook Fordyce rehabbed a knee injury. As luck would have it the two weeks that I was in Norfolk the baseball card guy came and took photos. My teammates knew that I was pretty much playing just to get that elusive card. Fortunately for me Jay Payton (supplemental 1st round pick) held out for more money. When he finally arrived to Pittsfield the baseball card guy came back. Before he left I made sure he took my picture along with Payton's. The following year was the strike year and I broke camp in AA Binghamton but about a month into the season I was released. My final season was with the Richmond Roosters of the Frontier League. As my career would have it...the day I was leaving the team to come back to Atlanta to have career ending back surgery the guys were out in the outfield taking team photos and of course baseball card pics. I grew up collecting baseball cards and I am happy to have one of my own. Even though it took parts of 6 professional seasons it was worth the journey." Thanks! Does anyone have the 1994 Pittsfield set? I couldn't find a picture of this card online. Maybe a Mets minor league team set collector like Paul's Random Stuff? Wow. I can't believe the Giants pulled it out again. Eli really is magic in the fourth quarter. When I first started collecting cards I actually collected football first. I first started collected football cards in 1986 and baseball cards in 1987, and collected them both for a few years. However, after 1989 I stopped buying football cards and concentrated on baseball. The one exception was after the 2008 Super Bowl win, when I bought a Giants team set. I'll probably do the same this year. 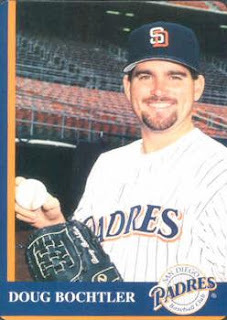 Doug Bochtler pitched for the Padres, Tigers, Dodgers and Royals from 1995 to 2000, winning nine games and saving six. Now the owner of the Cherokee Baseball Facility in Tennessee, he kindly answered my questions about baseball cards. "No really good stories about my cards. My favorite card is from San Diego 1996 or 1997." Thanks! He had four cards with the Padres, 1996 Leaf Signature, 1997 Fleer, and 1996 and 1997 Padres Mother's Cookies, the latter of which is pictured here. The one card I have of him is with the Rockies, from 1993 Topps. 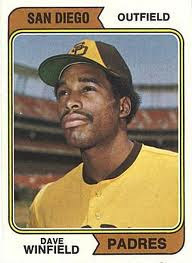 Willie Blair pitched twelve seasons in the major leagues for eight different teams. His best season was 1997 when he went 16-8 for Detroit. Now the pitching coach for the Fort Wayne Tin Caps in the Padres organization, he kindly answered my questions about baseball cards. "I do not collect cards as a hobby. I have tried to collect all of my cards to pass on to my kids but that's about it." Infielder Brendan Harris has played for the Cubs, Expos, Reds, Devil Rays and Twins, and was in the Orioles organization in 2011. 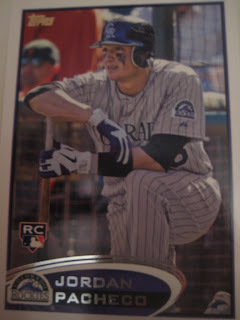 He has signed with the Rockies for 2012. 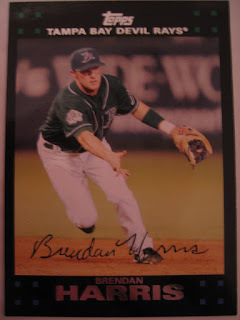 Also the owner of the Brendan Harris Baseball Clinic in Wisconsin, he kindly answered my questions about baseball cards. "I played with two guys in AA where they put the wrong names under their pictures. 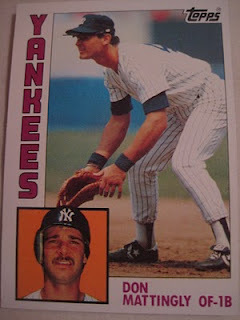 I don't collect a lot of cards, but my favorite is a Don Mattingly rookie card." Thanks! 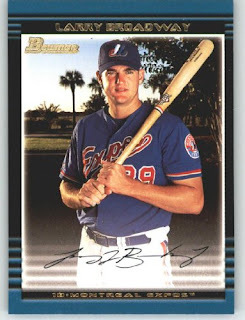 He played AA ball for the West Tennessee Diamond Jaxx in 2002 and 2003 - if anyone has those team sets you may want to check them out. 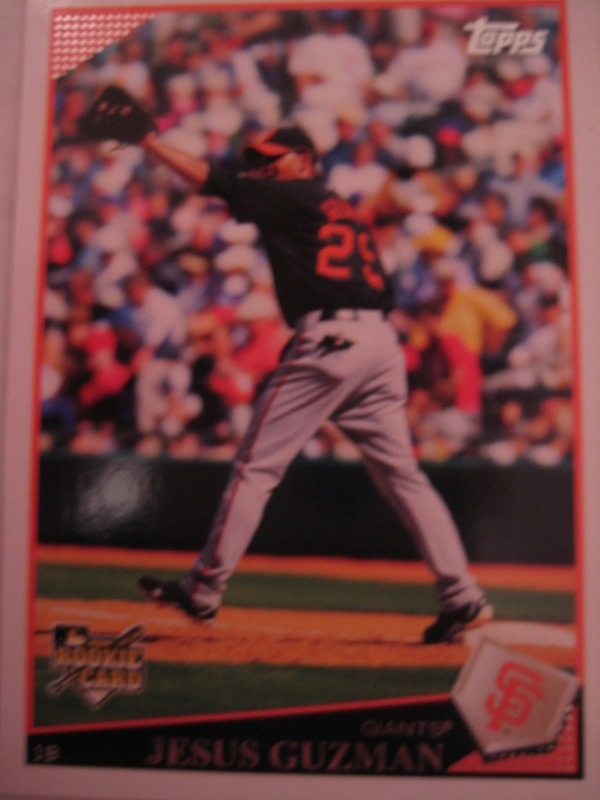 Here is a card of Harris from 2007 Topps Update.